9781410476791 | Large print edition (Wheeler Pub Inc, February 4, 2015), cover price $33.99 | also contains The Peripheral | About this edition: Depending on her veteran brother's benefits in a city where jobs outside the drug trade are rare, Flynne assists her brother in beta testing a video game only to uncover an elaborate murder scheme. 9780670921553 | Gardners Books, November 20, 2014, cover price $28.65 | also contains The Peripheral | About this edition: 1st UK ed. 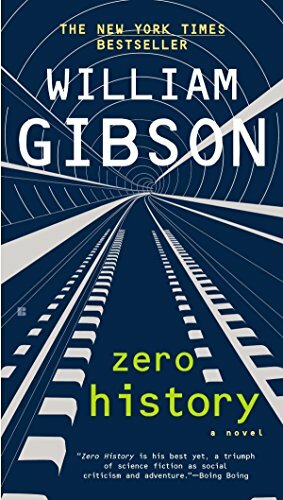 9780399158445 | Berkley Pub Group, October 28, 2014, cover price $28.95 | About this edition: The New York Times bestselling author of Neuromancer and Zero History presents a fast-paced sci-fi thriller that takes a terrifying look into the future. 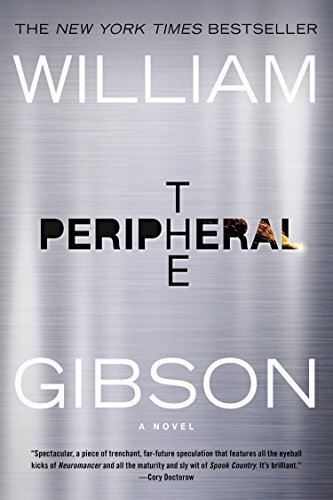 9780425276235 | Berkley Pub Group, October 6, 2015, cover price $17.00 | also contains The Peripheral | About this edition: The New York Times bestselling author of Neuromancer and Zero History presents a fast-paced sci-fi thriller that takes a terrifying look into the future. 9781594139154 | Large print edition (Large Print Pr, October 6, 2015), cover price $17.00 | also contains The Peripheral | About this edition: Depending on her veteran brother's benefits in a city where jobs outside the drug trade are rare, Flynne assists her brother in beta testing a video game only to uncover an elaborate murder scheme. 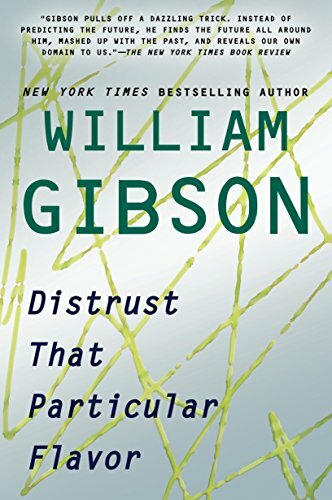 Product Description: William Gibson's dark visions of computer cowboys, bio-enhanced soldiers of fortune, and hi-tech lowlifes have won unprecedented praise. Included here are some of the most famous short fiction and novellas by the author of Count Zero and Neuromancer. 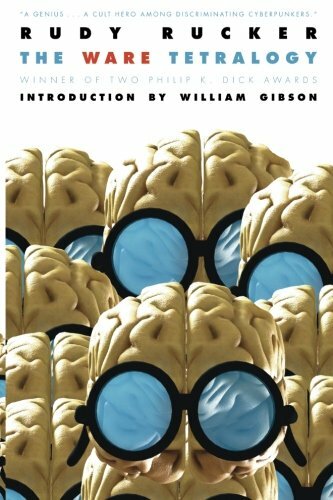 9780060539825 | Reprint edition (Harpercollins, July 1, 2003), cover price $13.99 | About this edition: Ten short stories by the Hugo and Nebula Award-winning author of Neuromancer deal with a human memory bank, UFOs, sleep machines, interstellar travel, a Soviet space station, and computer crime in such works as 'Johnny Mnemonic' and the title tale. 9780613925457 | Turtleback Books, July 29, 2003, cover price $25.70 | About this edition: William Gibson's dark visions of computer cowboys, bio-enhanced soldiers of fortune, and hi-tech lowlifes have won unprecedented praise. 9788492919116 | Urano, April 30, 2012, cover price $25.95 | About this edition: Hollis Henry, ex-cantante de rock convertida en periodista, acepto trabajar de nuevo para el genio secreto de Finanzas belga, Hubertus Bigend, solo para encontrarse atrapada en una amenazada red de mercadeo posmoderno, corruptos contratistas militares estadounidenses, y romance tardio. 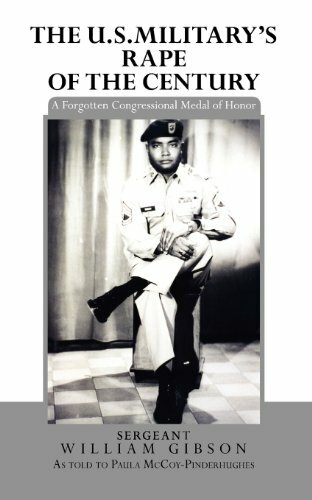 9780578096148 | Lightning Source Inc, February 28, 2012, cover price $14.99 | About this edition: Sergeant William Gibson saved the lives of more than 1500 soldiers in danger of land mines by maneuvering the tires of his ammunition truck to clear a path to safety while stationed in Korean. 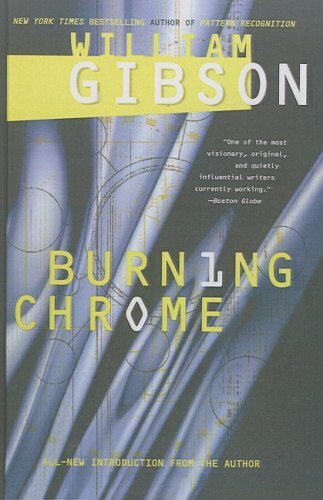 9780399158438 | 1 edition (Putnam Pub Group, January 3, 2012), cover price $26.95 | About this edition: William Gibson is known primarily as a novelist, with his work ranging from his groundbreaking first novel, Neuromancer, to his more recent contemporary bestsellers Pattern Recognition, Spook Country, and Zero History. 9780425252994 | Berkley Pub Group, September 4, 2012, cover price $16.00 | About this edition: A collection of New York Times bestselling author William Gibson’s articles and essays about contemporary culture—a privileged view into the mind of a writer whose thinking has shaped not only a generation of writers but our entire culture. 9780440119753, titled "Dragon of Destiny" | Dell Pub Co, December 1, 1981, cover price $2.95 | also contains Dragon of Destiny | About this edition: BOUND BY PASSION A world of unquenchable desire was unleashed when the dashing Rupert Torrington walked into her life. 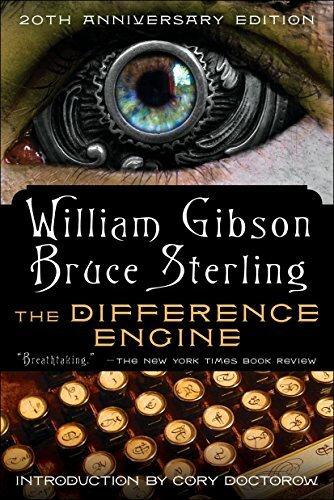 9780440423621 | 20 anv edition (Spectra, July 26, 2011), cover price $16.00 | also contains The Difference Engine | About this edition: The 20th anniversary edition of the classic steampunk novel With new commentary by the authors 1855: The Industrial Revolution is in full swing, powered by steam-driven cybernetic Engines. 9781410434906 | Large print edition (Thorndike Pr, February 16, 2011), cover price $31.99 | also contains Zero History | About this edition: While an ex-singer-turned-journalist unsuccessfully struggles to avoid notice by twisted marketing genius Bigend, a talented Russian linguist emerges from rehabilitation amid Bigend's discovery of an anonymous rival on the global market. 9780399156823 | Putnam Pub Group, September 7, 2010, cover price $26.95 | About this edition: The iconic visionary returns with his first new novel since the New York Times bestseller Spook Country. 9780670919529 | Gardners Books, September 2, 2010, cover price $33.40 | also contains Zero History | About this edition: Former rock singer Hollis Henry has lost a lot of money in the crash, which means she can't turn down the offer of a job from Hubertus Bigend, sinister Belgian proprietor of mysterious ad agency Blue Ant. 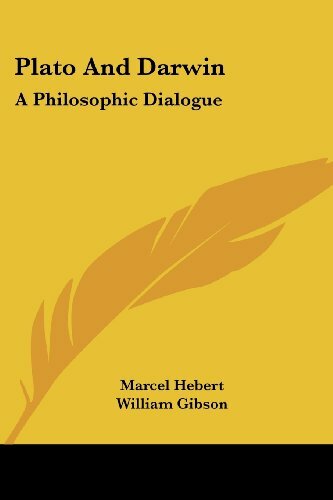 9780425259450 | Reprint edition (Berkley Pub Group, October 2, 2012), cover price $9.99 | also contains Zero History | About this edition: Hollis Henry never intended to work for global marketing magnate Hubertus Bigend again. 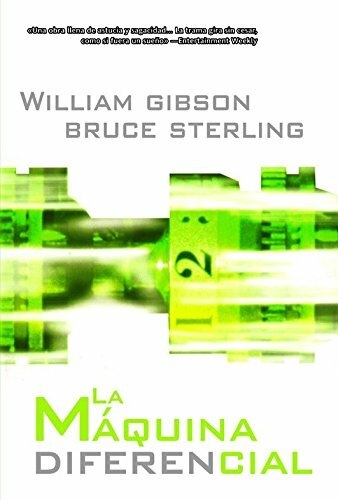 9780425240779 | Reprint edition (Berkley Pub Group, August 2, 2011), cover price $16.00 | also contains Zero History | About this edition: “The god of speculative fiction…comes up with another paranoid, high-tech dystopian thriller. 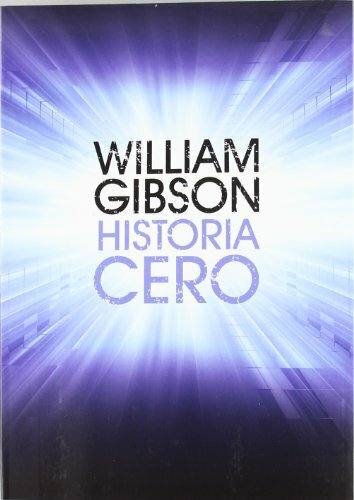 9780670919543 | Gardners Books, August 30, 2010, cover price $22.85 | also contains Zero History | About this edition: Unabridged, 9 CDs, 11 hours Read by TBA William Gibson's first new novel since Spook Country. Product Description: An omnibus of Rudy Rucker's groundbreaking series [Software, Wetware, Freeware, and Realware], with an introduction by William Gibson, author of Neuromancer. 9781607012115 | Prime Books, June 1, 2010, cover price $24.95 | About this edition: An omnibus of Rudy Rucker's groundbreaking series [Software, Wetware, Freeware, and Realware], with an introduction by William Gibson, author of Neuromancer. 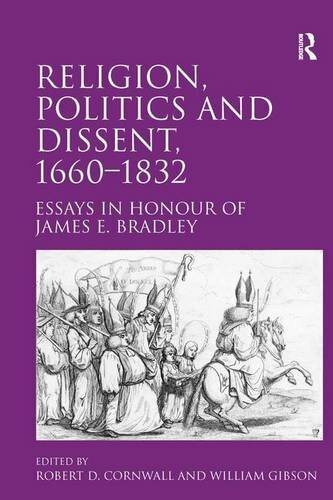 9780754663843, titled "Religion, Politics and Dissent, 1660â1832: Essays in Honour of James E. Bradley" | Ashgate Pub Co, December 15, 2009, cover price $149.95 | also contains Religion, Politics and Dissent, 1660-1832: Essays in Honour of James E. Bradley | About this edition: The idea of the long eighteenth century (1660-1832) as a period in which religious and political dissent were regarded as antecedents of the Enlightenment has recently been advanced by several scholars. 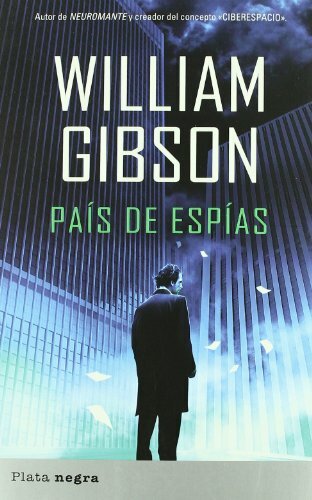 9788493696047, titled "Pais de espias / Spook Country" | Italian edition edition (Spanish Pubs Llc, October 26, 2009), cover price $22.95 | About this edition: Hollis Henry, ex cantante pop, ahora trabaja de periodista. 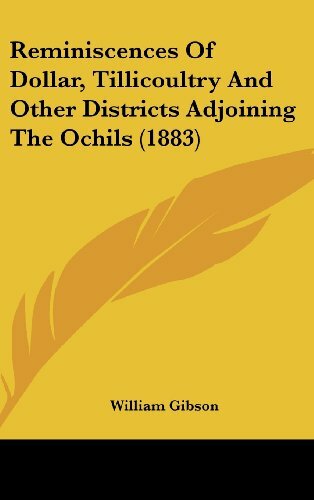 9780559414886, titled "Reminiscences of Dollar, Tillicoultry, and Other Districts Adjoining the Ochils" | Bibliobazaar, October 30, 2008, cover price $30.99 | About this edition: This is a pre-1923 historical reproduction that was curated for quality. 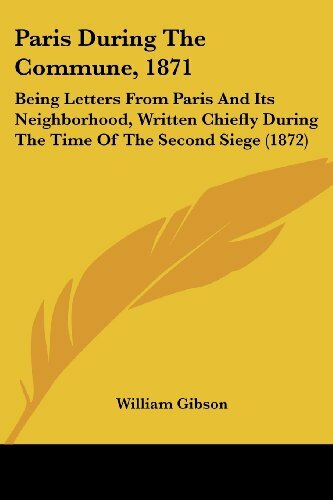 9781437229103 | Kessinger Pub Co, October 30, 2008, cover price $42.95 | About this edition: This scarce antiquarian book is a facsimile reprint of the original. 9781437100563 | Kessinger Pub Co, October 30, 2008, cover price $27.95 | About this edition: This scarce antiquarian book is a facsimile reprint of the original. 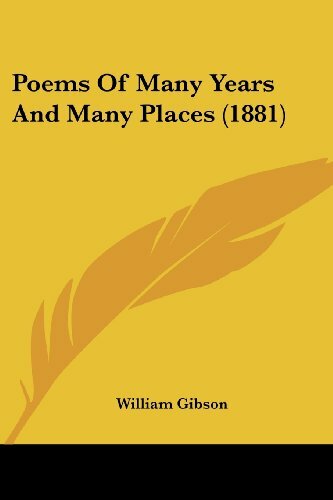 9780559414862, titled "Reminiscences of Dollar, Tillicoultry, and Other Districts Adjoining the Ochils" | Bibliobazaar, October 30, 2008, cover price $18.99 | About this edition: This is a pre-1923 historical reproduction that was curated for quality. 9781437193138 | Kessinger Pub Co, October 30, 2008, cover price $36.95 | About this edition: This scarce antiquarian book is a facsimile reprint of the original. 9781437062625 | Kessinger Pub Co, October 31, 2008, cover price $21.95 | About this edition: This scarce antiquarian book is a facsimile reprint of the original. 9781437208498 | Kessinger Pub Co, October 30, 2008, cover price $39.95 | About this edition: This scarce antiquarian book is a facsimile reprint of the original. 9781437078916 | Kessinger Pub Co, October 31, 2008, cover price $24.95 | About this edition: This scarce antiquarian book is a facsimile reprint of the original. 9780554815596 | Bibliobazaar, August 31, 2008, cover price $28.99 | About this edition: This is a pre-1923 historical reproduction that was curated for quality. 9780554815558 | Bibliobazaar, August 31, 2008, cover price $23.75 | About this edition: This is a pre-1923 historical reproduction that was curated for quality. 9780554815497 | Large print edition (Bibliobazaar, August 31, 2008), cover price $22.99 | About this edition: This is a pre-1923 historical reproduction that was curated for quality. 9781410403117 | Large print edition (Thorndike Pr, January 9, 2008), cover price $30.95 | also contains Spook Country | About this edition: Multilingual Tito engages in sensitive information transfers from his single-room apartment, while journalist Hollis frets over her start-up magazine's censure of its own promotions, and prescription drug addict Milgrim wonders about the military connections of an enigmatic benefactor. 9780670914944 | Gardners Books, August 2, 2007, cover price $40.15 | also contains Spook Country | About this edition: Tito and Alejandro's Aunt Jauna had all the skills that were needed in Cuba - a thousand tricks of the forger's art. 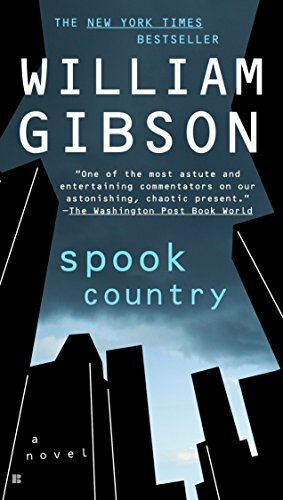 9780425226711 | Reprint edition (Berkley Pub Group, March 3, 2009), cover price $9.99 | also contains Spook Country | About this edition: The “cool and scary”(San Francisco Chronicle) New York Times bestseller from the author of Pattern Recognition and Neuromancer. 9780425221419 | Reprint edition (Berkley Pub Group, June 3, 2008), cover price $15.00 | also contains Spook Country | About this edition: The “cool and scary”(San Francisco Chronicle) New York Times bestseller from the author of Pattern Recognition and Neuromancer. 9780143142201 | Unabridged edition (Penguin/Highbridge, August 7, 2007), cover price $29.95 | About this edition: Multilingual Tito engages in sensitive information transfers from his single-room apartment, while journalist Hollis frets over her start-up magazine's censure of its own promotions, and prescription drug addict Milgrim wonders about the military connections of an enigmatic benefactor. 9780399154300 | Putnam Pub Group, August 7, 2007, cover price $25.95 | About this edition: Multilingual Tito engages in sensitive information transfers from his single-room apartment, while journalist Hollis frets over her start-up magazine's censure of its own promotions, and prescription drug addict Milgrim wonders about the military connections of an enigmatic benefactor. 9781416590842, titled "The Miracle Worker" | Reprint edition (Scribner, June 17, 2008), cover price $12.99 | About this edition: Based on the remarkable true story of Helen Keller and her teacher Annie Sullivan, this inspiring and unforgettable play has moved countless readers and become an American classic. 9780743457583, titled "The Miracle Worker" | Pocket Books, June 25, 2002, cover price $6.99 | About this edition: A text of the television play, intended for reading, of Anne Sullivan Macy's attempts to teach her pupil, Helen Keller, to communicate. 9780573612381, titled "The Miracle Worker" | Samuel French Inc Plays, January 1, 1985, cover price $0.02 | About this edition: Drama / 7m, 7f / Unit set Immortalized onstage and screen by Anne Bancroft and Patty Duke, this classic tells the story of Annie Sullivan and her student, blind and mute Helen Keller. 9780553247787 | Reissue edition (Skylark, October 1, 1981), cover price $5.99 | About this edition: A text of the television play, intended for reading, of Anne Sullivan Macy's attempts to teach her pupil, Helen Keller, to communicate. 9780606285858, titled "The Miracle Worker" | Demco Media, June 1, 2003, cover price $14.53 | About this edition: A text of the television play, intended for reading, of Anne Sullivan Macy's attempts to teach her pupil, Helen Keller, to communicate. 9780606010825 | Demco Media, October 1, 1981, cover price $13.53 | About this edition: A text of the television play, intended for reading, of Anne Sullivan Macy's attempts to teach her pupil, Helen Keller, to communicate. 9781439530276, titled "The Miracle Worker" | Reprint edition (Paw Prints, August 11, 2008), cover price $15.99 | About this edition: Drama / 7m, 7f / Unit set Immortalized onstage and screen by Anne Bancroft and Patty Duke, this classic tells the story of Annie Sullivan and her student, blind and mute Helen Keller. 9780606372466, titled "The Miracle Worker" | Turtleback Books, June 17, 2008, cover price $24.50 | About this edition: FOR USE IN SCHOOLS AND LIBRARIES ONLY. 9780613610407 | Turtleback Books, July 1, 2003, cover price $17.20 | About this edition: A text of the television play, intended for reading, of Anne Sullivan Macy's attempts to teach her pupil, Helen Keller, to communicate. 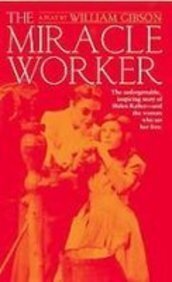 9780881035711, titled "The Miracle Worker" | Turtleback Books, October 1, 1999, cover price $13.85 | About this edition: Deaf, blind, and mute twelve-year-old HelenÂ Â Keller was like a wild animal. 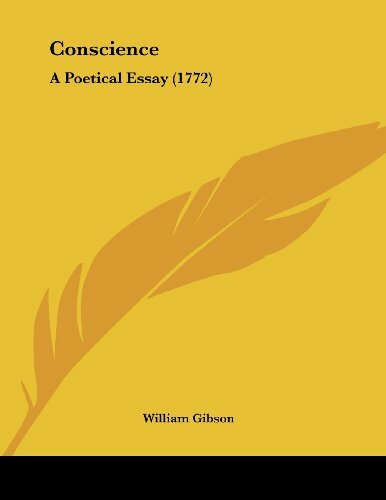 9780548877951 | Kessinger Pub Co, February 28, 2008, cover price $15.95 | About this edition: This scarce antiquarian book is a facsimile reprint of the original. 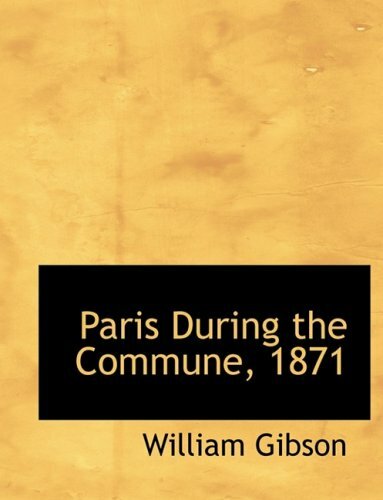 9780548886687 | Kessinger Pub Co, February 28, 2008, cover price $15.95 | About this edition: This scarce antiquarian book is a facsimile reprint of the original. 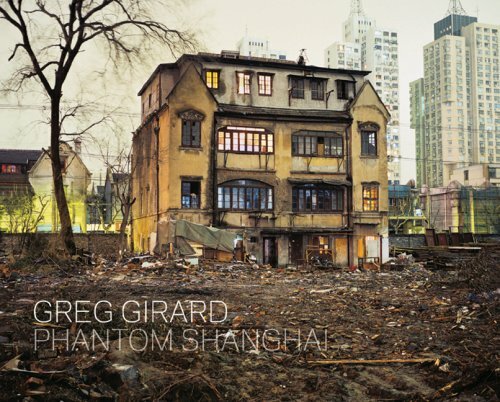 9780973973914 | Bilingual edition (Magenta Pub for the Arts, April 1, 2007), cover price $50.00 | About this edition: “Shanghai—a city in the process of dismantling its history to accommodate China’s new cosmopolitan vision of itself. 9781430491255 | Kessinger Pub Co, January 30, 2007, cover price $16.95 | About this edition: This scarce antiquarian book is a facsimile reprint of the original. 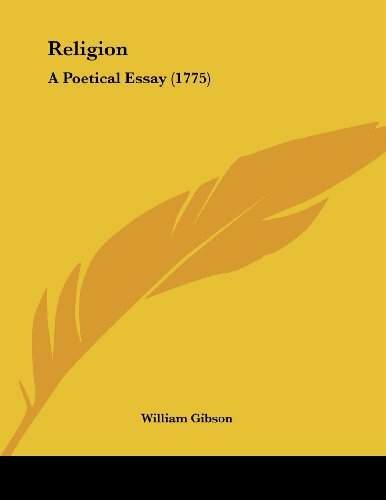 9780838756379 | Bucknell Univ Pr, January 30, 2007, cover price $49.50 | About this edition: Offering a fresh perspective on a misunderstood eighteenth-century novelist, this study situates Tobias Smollett (1721-71) as the chief witness to the birth of the modern commercial art market. 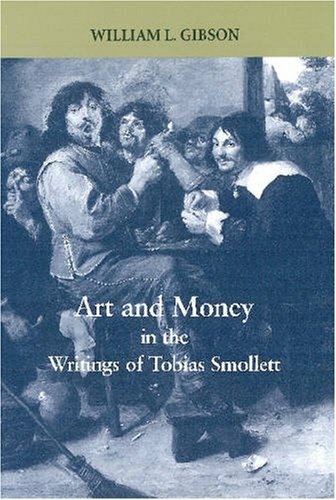 9781611482478 | Bucknell Univ Pr, January 1, 2007, cover price $75.00 | About this edition: Shedding new light on a misunderstood master, this study situates Tobias Smollett (1721-1771) as a key witness to the birth of the modern commercial art market. 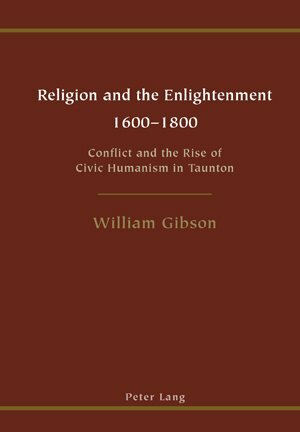 9780820483177 | 1st edition (Peter Lang Pub Inc, December 30, 2006), cover price $71.95 | About this edition: This book considers how Early Modern England was transformed from a turbulent and rebellious kingdom into a peaceable land. 9783039109227 | 1 edition (Peter Lang Pub Inc, December 30, 2006), cover price $84.95 | About this edition: This book considers how Early Modern England was transformed from a turbulent and rebellious kingdom into a peaceable land. The computer age has arrived a century ahead of time--in the High Victorian age--and Great Britain, with the benefit of new technology, prepares to better the world. 9788498002812 | Italian edition edition (LA Factoria De Ideas, November 30, 2006), cover price $23.95 | About this edition: The computer age has arrived a century ahead of time--in the High Victorian age--and Great Britain, with the benefit of new technology, prepares to better the world.